Topics: // Offering, // Clients, and // Connect. Age: It went live on May 11th 2001, making it over 16 years, 11 months old. On average 1.30 pages are viewed each, by the estimated 28 daily visitors. It is hosted by Cloudflare Inc. California, using cloudflare-nginx web server. 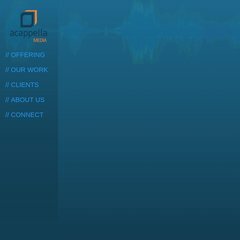 Acappellamedia.com's server IP number is 173.245.61.115. There are 2 Nameservers, kay.ns.cloudflare.com, and matt.ns.cloudflare.com.